US Post Office to change rates on May 31, 2015!!! The chart below only show First Class rates. 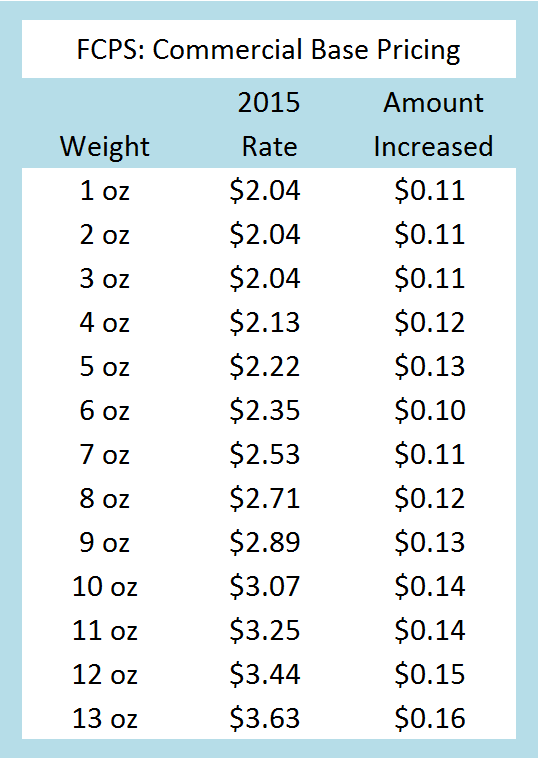 These are online Commercial Base rates like what you pay when you buy Etsy shipping labels. No change for Domestic Priority and Express rates. Canada is now split into 7 postal zones with Priority Mail International rates ranging from $26.75 to $32.63 for a 1 lb. package. I reorganized the post office Excel worksheet with different colored tabs for different things. The red ones are Commercial base rates, blue are international and purple are counter rates. REMEMBER: As an Etsy seller buying Etsy shipping labels you can ship First Class for Packages Weighing up to 16 Ounces. Below is the text directly from Etsy (www.etsy.com/help/article/5435). I could not find any information stating this will still apply after May 31, 2015. As a result of our partnership with the USPS, we are able to offer First Class domestic postage for packages weighing up to 16 ounces. The actual new weight limit for First Class is 15.999 ounces. It is not possible to enter fractional values in the weight field on the label purchase form. 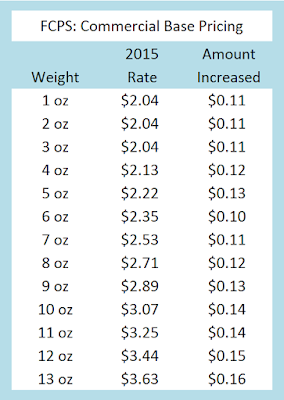 Therefore, to take advantage of the full weight range, you may apply the typical rule of rounding up to the nearest ounce and enter 16 oz**. ** as the weight for a package that weighs between 15 and 15.999 ounces. If your package actually weighs 16 ounces or over, it is not eligible for First Class postage.